Our runaway best seller and a delightful treat for the skin! 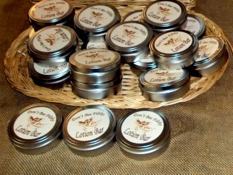 Our solid lotion bar is made with Almond Oil, Shea Butter, Beeswax, Vitamin E Oil, and a light Pomegranate Fragrance. 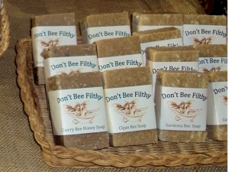 Don't Bee Filthy Bath Treats are handmade using all natural ingredients and Cross Creek Honey and/ or Beeswax. Honey is an a natural humectant and helps the skin retain moisture and has been used for thousands of years in many beauty products. We hope you enjoy! A delightful mixture of wonderful skin nourishing oils; almond, canola, coconut, soybean, and olive oil plus Cross Creek Honey and Beeswax . Made the old fashioned cold process method. 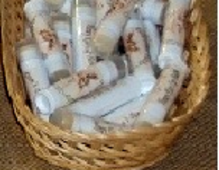 Almond Oil, Honey, and Cross Creek Beeswax helps keep your lips soft. Please note we are just returning to soaping after the birth of our 1st baby. Our soap is still curing and will take a minimum of 3 weeks to cure. Please expect a delay in the shipping of any soap. Thank you for your patience!